Illuminating Justice explores the call to social ethics in The Saint John's Bible, the first major handwritten and hand-illuminated Christian Bible since the invention of the printing press. 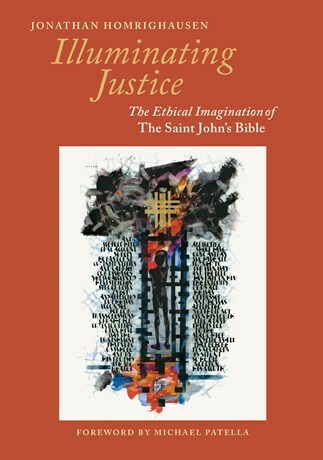 Situating his close analysis of The Saint John's Bible's illuminations in the context of contemporary biblical exegesis and Catholic teaching, Homrighausen shows how this project stimulates the ethical imagination of its readers and viewers on matters of justice for women, care for creation, and dialogue between Jews and Christians. Written for scholars, pastors, teachers, and any fan of The Saint John's Bible, this book shows how beauty and justice intertwine in this wondrous illuminated Bible for the new millennium. Jonathan Homrighausen (MA, Graduate Theological Union) is currently pursuing a PhD in Hebrew Bible/Old Testament at Duke University. He spent two years with the Heritage Edition of The Saint John's Bible while working in Archives & Special Collections at Santa Clara University. He is co-author, with J. David Pleins, of Biblical Hebrew Vocabulary by Conceptual Categories: A Student's Guide to Nouns in the Old Testament (Zondervan, 2017). "'Beauty is in the eye of the beholder,' a phrase coined in the nineteenth century by Margaret Wolfe Hungerford, corresponds with what today's biblical interpreters refer to as `the world in front of the text.' In other words, there is a subjective quality to all interpretation. Jonathan Homrighausen here provides us with a stunning example of such interpretation. Reading the exquisite illuminations found in The Saint John's Bible, he lifts up three ethical-sacramental themes: respect for Jewish sensitivities; attention to feminist concerns; and appreciation for natural creation. In this remarkable book, he thus shows us that art is not only an expression of beauty, but of justice as well." "Jonathan Homrighausen has done what the creators of The Saint John's Bible hoped for most. He has explored its `beautiful persuasion' to reveal the way its beauty speaks across volumes and across audiences as it proclaims the Good News. Illuminating Justice is truly a joy to read. While going deep into key images in The Saint John's Bible, Homrighausen shows how this Bible, while using ancient tools and traditional materials, fits into a new world of theological thought. It is one that approaches the relationship between Catholics and Jews, the role of women, and creation care, in fresh and empowering ways. This volume rings with insight and draws our attention to the work of numerous contemporary theologians and artists. Reading it, one will discover things not just about art, but also about living out one's faith in the 21st century." "It is hard to find fault with a monograph that accomplishes its goals so well, and I have nothing critical to say about Homrighausen's broad research or clear writing. Illuminating Justice exhibits the youthful enthusiasm of a graduate student, but it is far from immature. It is a work of serious theological reflection which deserves a wide audience." "This book picks up the spirit of The Saint John's Bible and is a study of the impact of some aspects of its artistry." "Those who are unfamiliar with The Saint John's Bible will find here a wonderful overview of the vision of the monks and all those who worked together to bring the project to life." "Skillfully tracing the intertext between artistic illuminations and biblical passages, Jonathan Homrighausen's sensitive exegeses afford exquisite depth and dimension to three familiar biblical traditions as well as invite readers to experience for themselves The Saint John's Bible. Tracing the motif of trees across Jesus Family Tree in Matthew's Gospel, the Trees of Knowledge and Life in Women's Biblical Stories, and the centrality of Trees in the Creation Traditions, Homrighausen ignites our imagination with new possibilities not only for fresh interpretations of these texts but also for how they urgently summon us to the promotion of justice." "This volume is itself an introduction to visual art as an essential element of biblical interpretation. Homrighausen's own rich `sacramental imagination' is always in view, never intrusive, as he follows images across cultures, centuries of religious traditions, both Jewish and Christian, and the two Testaments of the Christian Bible." "In this gem of a book, Jonathan Homrighausen not only takes us on a lavishly illustrated tour of The Saint John's Bible—an artistic achievement unparalleled since the Middle Ages—but he reveals the ethical power of its images: for interreligious dialogue, women's rights, and ecology. Jonathan Homrighausen is a creative emerging voice in imaginative theology and his adventurous book deserves a readership across disciplinary boundaries."